On 25 July 2017, a 15-year-old youth from Tuqu is arrested by Israeli soldiers at 2:00 a.m. and accused of throwing stones. He is interrogated multiple times and reports not being informed of his legal rights under military law. I was awake keeping an eye on the neighbourhood as I heard that Israeli soldiers were in my village. It was around 2:00 a.m. I looked out the window when I heard a commotion outside and I saw about 40 soldiers. When I saw my cousin with them I realised they were coming to our house. Shortly afterwards I heard very loud banging at our front door. My father answered and about 20 soldiers entered our home. They immediately asked my brother for his age and then asked me. Then they asked to see my identity card. Two soldiers followed me into my bedroom and when they saw my identity card they told me to get ready because I was under arrest. The soldiers did not tell me why I was under arrest but they gave my family a document with some details written in Hebrew. I was allowed to dress and to say goodbye to my family. Then I was taken outside where I was handcuffed to the front which were not painful. I was also blindfolded. Then I was put in the back of a jeep where I sat on a seat. The jeep drove to the nearby military base where I sat on a seat until around 7:00 a.m. During this time I was examined by a doctor who removed the blindfold and put it back on afterwards. Then I was taken back to the jeep which drove to the police station in Etzion settlement. I arrived there at around 8:00 a.m. Shortly after arrival at Etzion an interrogator took me to a room. On the way he slapped me hard while I was still blindfolded and asked me whether I knew who had been interrogated the day before. Then he named one of my friends and told me he was at the police station the day before. Once in the interrogation room I was made to sit on the floor. The interrogator slapped me again on the face very hard. I was still blindfolded and handcuffed. He did not inform me of my rights. Then he took me outside and told me he wanted to know how many times my friend threw stones with me. He also wanted to know where and why. I told him I did not throw stones and did not know anyone who did. He told me I was a liar and slapped me harder. The he tightened the hand cuffs and I was in pain. Then he swore at me and called my mother and sisters “whores”. He also threatened to lock me up in prison for 20 years. Then he told me he did not want me to confess against anyone else but wanted me to confess against myself. He told me if I confessed to throwing one stone on one occasion he would release me. I denied the accusation but he kept repeating the question and slapping me. In the end I confessed to throwing one stone, which missed, from a distance of 80 meters. I confessed because he kept beating me and I wanted him to stop. Then he asked me if I wanted a lawyer. At first I said no but then I told him I wanted a lawyer. Then he took me to see another interrogator. The first interrogator interrogated me for about an hour and did not show me any documents to sign. The second interrogator did not inform me of my rights either. He removed the blindfold and wanted to know when I threw stones. He had a tape recorder in the room but I don’t think it was turned on. He told me my friend had confessed that I had thrown stones on 23 December 2016. I denied the accusation but he kept repeating the same accusation. He kept insisting and in the end I confessed to throwing one stone. The second interrogation lasted for about 30 minutes. He did not ask me to sign any documents and took me to see a third interrogator. The third interrogator had a tape recorder on. He showed me a document written in both Hebrew and Arabic about my right to remain silent and my right to consult with a lawyer. I did not understand it very well but I understood I should not confess. He repeated the same questions as the other interrogators and was typing on his computer. Then he printed out a document in Hebrew and asked me to sign it but I refused to sign and asked for an Arabic translation. He gave me the document in Arabic and I read it and then I signed it. Then he called a lawyer and allowed me to speak to him on the phone. The lawyer asked me whether I had confessed and I told him I confessed to throwing one stone. Then he told me he would see me in court. Then I was taken to a prison cell at Etzion where they removed the handcuffs and I was searched in my underwear. I was given some food but I found it unappetizing and did not eat. At around midnight I was taken to Ofer prison but I was immediately sent back to Etzion where I spent the night. The following day I was taken to the military court at Ofer. My lawyer was not there and the hearing was adjourned for six days. During this time I was taken to Al Maskobiyya police station in Jerusalem but the authorities refused to admit me and I was taken back to Etzion and then to Ofer. On the way to Ofer my nose was bleeding from all the slapping and a soldier gave me some tissues. I arrived at Ofer at around midnight. At Ofer I was searched in my underwear and then taken to Section 13. A couple of days later I was taken to the settlement of Kiryat Arba where I was interrogated by an intelligence officer. He did not inform me of my rights and questioned me for about 10 minutes. 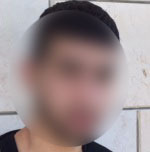 He told me that in my confession it was written that I threw a stone at around 4:00 p.m. whereas the military report said the clashes happened at around 2:00 p.m. After the interrogation I was taken back to Ofer prison. On 2 August 2017, I had another military court hearing. My parents were not in court and the hearing was adjourned. I had about 12-15 military court hearings. At the last hearing, which was on 29 November 2017, I was sentenced in a plea bargain to 5 months in prison and fined 2,000 shekels. Because my family could only pay 1,000 shekels I had to spend an additional month in prison. I was also given a suspended sentence of 6 months in prison valid for 3 years. On 17 December 2017, I was taken to a court in Hasharon prison, inside Israel, where they were supposed to decide whether to grant me an early release from prison. The hearing was adjourned because the intelligence officer did not give his opinion in time. I spent a night at Ramla prison inside Israel. Then I was taken back to Ofer. I had another hearing in a court inside Israel and I was granted early release. I was released on 24 December 2017 and I arrived home at around midnight. I spent my entire prison sentence at Ofer and my family visited me four times.